Try something new for brunch with our Apple-Waffle Sandwich recipe! 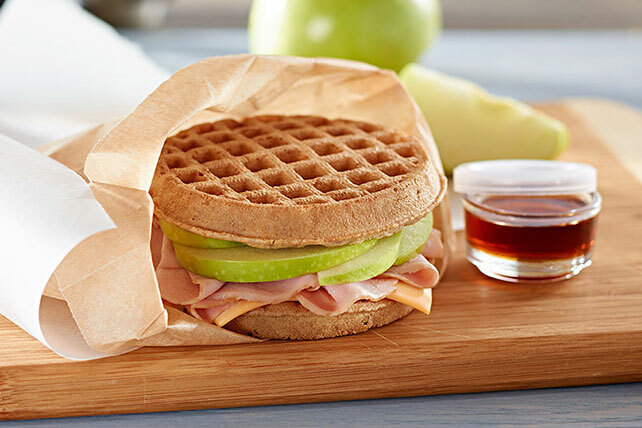 You'll love the crunchy combo of apple slices, ham and cheese in this waffle sandwich. Top 1 waffle with Singles, ham and apple slices. Cover with second waffle. Wrap sandwich in plastic wrap or foil. Pour syrup into sealable plastic container. Refrigerate until ready to serve. Prepare as directed. Place on microwaveable plate. Microwave sandwich on HIGH 30 to 45 sec. or until Singles are melted. Substitute 1 sliced small pear for the apple. Take your favorite breakfast meal and turn it into a favorite lunch!